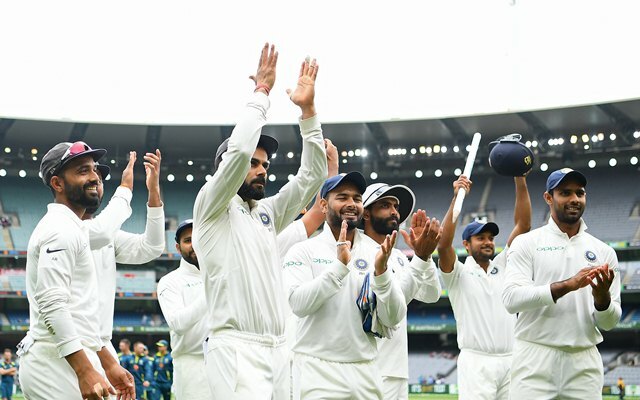 India retained the Border-Gavaskar Trophy with a 137-win in the Melbourne Test which was also the first ever Boxing Day Test victory for them at this venue. India needed two wickets on the final day but the rain made its presence by washing out the opening session. However, the play resumed after early Lunch and India needed only 4.3 overs to pick the remaining two wickets. India will fancy their chances of a maiden Test series win in Australia in the New Year Test in Sydney. 1 – This was the first time India won a Boxing Day Test match in Melbourne. Five of their previous seven Boxing Day Tests here resulted in defeats. Overall, this is India’s first Test win at the MCG since 1981 before any player from the current squads was born. 4 – For the first time in their Test history, India won as many as four matches outside Asia in a calendar year. Overall, this is the 3rd calendar year for India where they won four away Test matches. They defeated the home teams four times each in 2004 and 2010. 150 – This win was India’s 150th in Test cricket making them the 5th team after Australia (384), England (364), Windies (171) and South Africa (162) to reach the milestone. 25 – Number of times India have bowled out their opponents in Test cricket out of 27 innings in 2018; the most by them in a calendar year. India bundled out the opposing sides on 22 out of 28 Test innings in 2002. These are also the joint 2nd most times any team has managed to do in a calendar year in Test cricket. Australia bowled out the opposition on 26 times out of 30 innings in 2005 while South Africa had dismissed the opposite teams on 25 occasions out of 28 innings in 2008. 158 – Number of wickets for Indian pacers away from home in 2018; the 2nd most number of Test wickets away from home for a team’s paces in a calendar year. The Windies pacers collectively claimed 189 wickets in 1980. 11 – Virat Kohli’s 11 wins away from home are the most by any Indian captain. Sourav Ganguly also has 11 Test wins outside India. Both have six wins apiece outside Asia as captain. 21 – India never lost a Test match when Virat Kohli won the toss. India won 18 and drew three Test matches whenever Kohli won the toss. Bradman (10) is the only other captain to have won 10 and more tosses in Test cricket and being undefeated later. 9/86 – Jasprit Bumrah’s 9/86 in this Test match are the best bowling figures for an Indian pacer in a Test match in Australia. Bumrah also became the first Indian pacer to claim nine wickets in a Test match in Australia. The previous best match figures were 8/109 by Kapil Dev in the 1985 Adelaide Test. 20 – Rishabh Pant has claimed 20 catches in the three matches from this Test series which are the most number of dismissals made by an Indian wicketkeeper in a Test series. Pant thus surpassed 19 dismissals made by Naren Tamhane against Pakistan in 1954/55 and Syed Kirmani also against Pakistan in 1979. 42 – A total of 42 dismissals Pant has made in 2018; the joint-most by any wicketkeeper in the debut year. He equalled the record held by Brad Haddin in 2008 with 42 dismissals.